We’ve recently switched hosting companies, transferring our websites from Bluehost to Siteground. One of the benefits we had researched about Siteground was fast page loading times. We decided to run a page load speed test between the two hosts just to acquire our own data and (hopefully) see improvement in our own website’s loading times with our new host. Although this is not a full blown test (one round of data was taken by a single source), we hope the shared information will help others looking into whether website speeds are affected (and to what degree) by hosts. Websites: The nine sites listed below were not altered between the two tests. Their files, databases, redirects, etc. were held constant and are a direct transfer from old to new host. We have included the page size detected by Pingdom for both hosts, as it is shown to differ. Although these should be identical, there may have been a native compression of files on Bluehost, or something added on Siteground, unbeknownst to us. Nonetheless, page size and load times are shown so you can decipher the results informatively. Website URL: Tested at the root of each domain. Specific URL’s are not listed to protect owner privacy. First Run Test: All data shown are first run results. After collecting the first (and only) round of data, we tested a few second rounds to make sure the page size numbers stayed consistent on the new hosting server. They did, but load times didn’t. We actually received a faster result on Website #1 at 1.81 (s), showing an increase in speed by 7.65%. So, keep in mind load times are variable – you don’t always get the same number every test round. In doing this test again, I’d collect two or three rounds on each host to get an average. 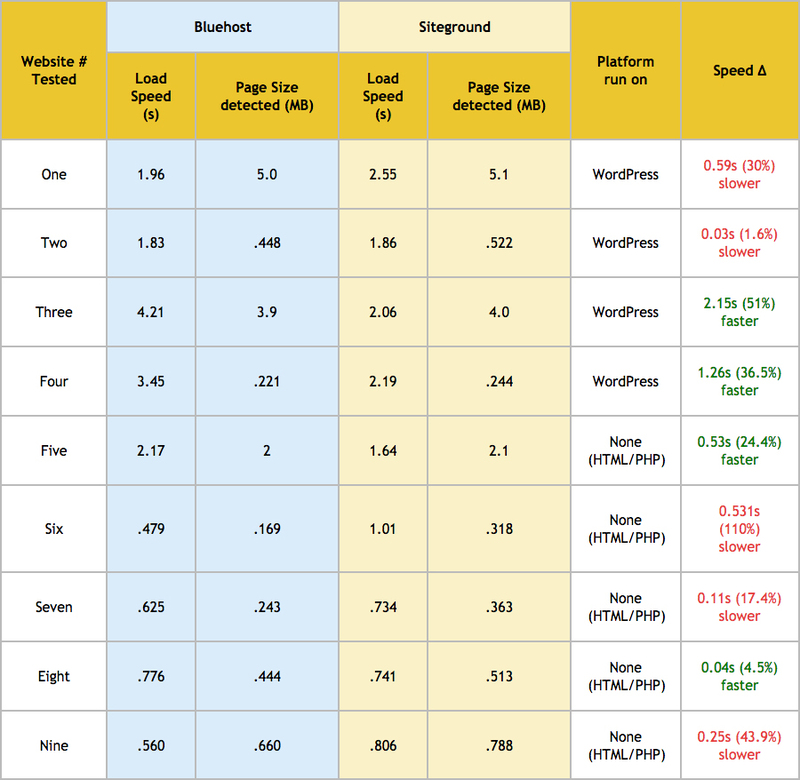 Also note that every site was detected to have a larger page size on Siteground than Bluehost, yet almost half have a faster speed on the new host. Whether this is due to a compression of files on Bluehost’s side or something added on Siteground’s is still to be determined. The largest “drop” in performance, Website #6, was detected to have almost double the page size, at 318 kB vs. originally 169 kB, which would explain the increase in page load speed by about a factor of 2. Although no data was taken, I think it also should be mentioned that the php forms on these websites responded immediately on the new Siteground server, which was a different case when hosted on Bluehost. When testing and filling out these php (contact) forms on the old server, it would often take 10-30 minutes to receive the e-mail sent by the form. But with the exact same forms and setup, I received it consistently within 30 seconds on Siteground. 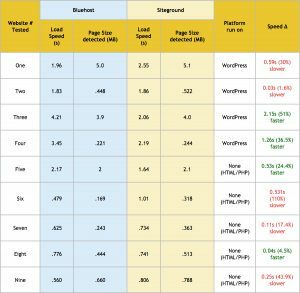 I also find it impressive that although all the websites are slightly larger in page size when detected on Siteground, almost half still have substantially faster load times. So to answer this post’s title, it does appear to make a difference in which host you choose, and from this test, I would account this switch as an overall improvement in page loading speed.